The Blue Butterfly is built in our workshop. It is hand painted blue with white dots on the edges and green spots on the middle part of the wings. The dimensions for the butterfly are 7.5 inches tall by 7.5 inches wide by 1.5 inches deep. The sign including the stake is 30 inches tall. The weight with packaging is 1 pound. For the continental U.S. shipping and handling is included in the listed price. For shipping outside the continental U.S. please contact us through our Contact Us page. The Green Butterfly is built in our workshop. It is hand painted green with white dots on the edges and yellow spots on the middle part of the wings. The Hot Pink Butterfly is built in our workshop. It is hand painted hot pink with white dots on the edges and green spots on the middle part of the wings. The Light Blue Butterfly is built in our workshop. It is hand painted light blue with white dots on the edges and yellow spots on the middle part of the wings. The Orange Butterfly is built in our workshop. It is hand painted orange with white dots on the edges and green spots on the middle part of the wings. The Pink Butterfly is built in our workshop. It is hand painted pink with white dots on the edges and purple spots on the middle part of the wings. The Purple Butterfly is built in our workshop. It is hand painted purple with white dots on the edges and yellow spots on the middle part of the wings. The Yellow Butterfly is built in our workshop. It is hand painted yellow with white dots on the edges and orange spots on the middle part of the wings. 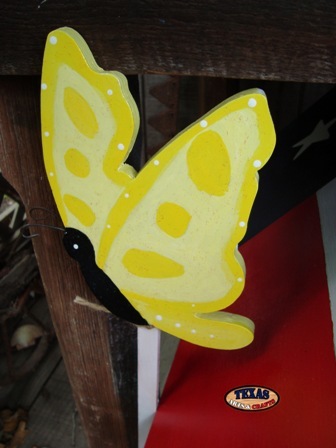 The Bright Yellow Butterfly is built in our workshop. It is hand painted yellow with white dots on the edges and dark yellow spots on the middle part of the wings.